In my view, tarot is most useful for self-development, because pulling cards for oneself and pondering the message – and then taking action to do whatever needs to be done – is a direct improvement or problem solving opportunity. But, we don't live in a vacuum, and nor are we islands. We all interact with other people every day and the majority our problems are not caused by only us, but they are caused, triggered, related to or made worse by others. How to use tarot to solve a curly situation with someone else? Firstly, there are at least two schools in tarot about reading about other people’s thoughts and emotions. Some people think that we should never ask how someone else feels or thinks, because it’s prying and morally wrong. I’m with the opposite school. I think that we as people are always trying to figure what the other people are up to – either directly by asking or indirectly by trying to deduct or guess based on our own experience and earlier encounters with the said person – so it’s impossible to live a human life without trying to understand other people. If cards can help us to understand others better and build bridges between people, then I think it’s justified to try and use tarot to figure what's going on in someone else's head and heart. b) never trust the cards blindly. It’s still possible that your take on the card is not correct, or it shows just a tiny snapshot of the person’s inner workings, or the situation changes rapidly and the person doesn’t think that way in the long run (life is fluid and ever-changing anyway), or your interpretation of the emotion is wrong (say: you see someone’s sad, think it’s because they deeply miss you, whereas they’re sad due to self-pity about losing the fight with you). So, what could you ask to help navigate a difficult situation? This exercise spread is for me and a relative: we don’t see eye to eye. My relative is sure that certain conspiracy theories are true, whereas I think they are nonsense. Consequently, we end up ruining happy family gatherings by arguing about this. Indecision and lack of clarity, but also two minds going to completely different directions. My truth simply is different to her truth, and they do not align or combine well. World is not black and white and everything can be seen from different angles - I guess I better remember this and acknowledge that neither of us has all of the facts nor absolute clarity about how things really are. I think it’s mainly about money and greed: these conspiracy theories (e.g. climate change is a hoax) are motivated by the need to earn more and more (big oil and gas businesses wanting to secure profit). It’s also about focusing only on the material world at the expense of any other, including spiritual or scientific take: if you only focus on what you can directly experience with your senses, you’ll miss a lot of data about the world - such as is there more air pollutants or not in the atmosphere? If you can’t see them, it doesn’t mean it’s not true. I think the person just wants to secure a happy, safe life to her and her family, with no need to worry about how someone’s going to take it all away one day and ruin the carefree, easygoing existence. The person also wants to go back to the past where no such things as climate change were ever heard of and hence, didn’t cause any trouble or hassle to anyone. It was a life of simply enjoying existence without having to worry about overpopulation, allocation of resources, environmental protection, survival of human kind etc. To ensure happy coexistence, environment and atmosphere for the extended family. I’m done with arguing, I’d just like everyone to enjoy each other’s company and live in harmony. This card talks about control and power, but also permanence and solidity in life: the bed rock of one’s life. It’s possible this person wants to expose the authority that is (in her view) wrongly exerted upon people (environmental taxes etc. ), or, she would want to have a solid ground how to live, without having to worry how these evil forces of the world want to disrupt her lifestyle by imposing rules. To understand each other, see eye to eye, be able to connect, listen and be heard – and feel happy about the existence and company of each other. Yes, that would be ideal. I suspect this means she’d like me to see the world like she sees it: see all those opportunities and threats that surround us, use my imagination more, accept that not everything is like the “mainstream media” wants to present it, that there can be more going on behind the closed doors. Stick to the facts, don’t get emotional. Stay grounded and mature, don’t engage into fights, don’t attack, but cut through any BS with clarity and confidence. There’s no real reason to fight, but, at the same time, there’s no real reason to not stand my ground and present my facts as I know them. And allow this same opportunity to her, too, it’s not just about me. Focus on feeling satisfied and happy, and also remember to party. I usually meet this relative in family parties and gettogethers, so focusing on having fun and appreciating the lovely food, drinks and company would work much better than engaging into petty bickering. This matter will be put to rest, it will die off. Yes, there might still be some arguments left but eventually we’ll move on, tired. The topic and the thoughts and worries associated to it will just die out, there is no energy and interest left to keep waving these swords at each other. The worst is upon us, it can't get worse than this, so we might just move on. Of course, using this spread does not guarantee that the other person is willing to cooperate or back off. But at least it gives you clarity on where the other person is coming from, what motivates them, and what would their ideal solution be, so that you can reassess your approach and see if you can offer an olive branch. If you can’t, at least you are better informed in your actions! 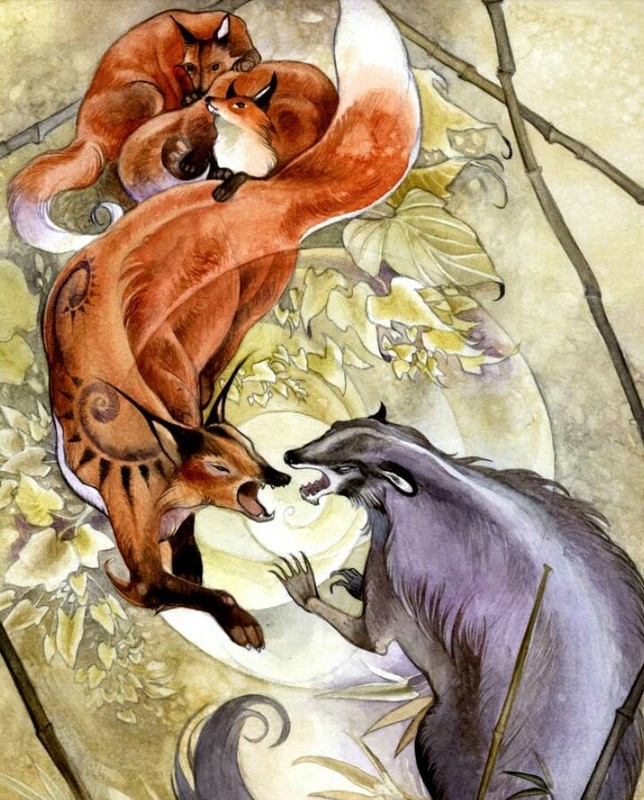 When we fight, we normally try to defend either literally or symbolically our existence or our cubs, the beloved "children" (projects, thoughts, feelings, anything we create). Instincts run unchecked. But, what about the other party? Most likely he or she is feeling exactly the same.